especially recommended for all children that may have a vitamin deficiency. 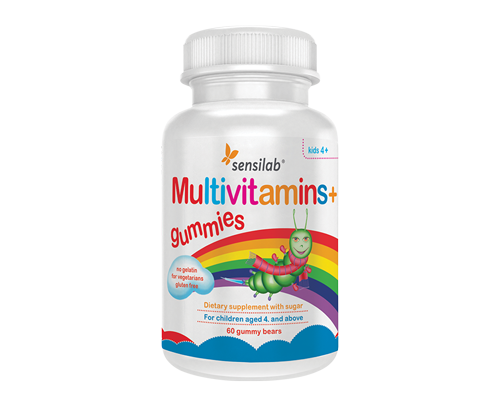 Multivitamin gummies are a healthier choice than other gummies because we used pectin as a gelling agent. Pectin is a naturally occurring substance (a polysaccharide) found in berries, apples and other fruit. We also used natural food coloring (black carrot) and flavoring (strawberry). In a form of delicious strawberry flavoured gummies that children will love. Suitable for children from age 4 and above. Use: Recommended daily intake: Children from 4 years of age: 1 gummy daily. Children from 6 years of age: 1-2 gummies daily. Active ingredients in 2 gummies: zinc 2 mg – 20% NRV, vitamin C 30 mg – 38% NRV, vitamin E 11.4 mg – 95% NRV, pantothenic acid 5.6 mg – 93% NRV, niacina 3 mg – 19% NRV, vitamin B6 1 mg – 71% NRV, vitamin A 600 μg – 75% NRV, folic acid 280 μg – 140% NRV, biotin 66 μg – 132% NRV, vitamin D3 10 μg – 200% NRV, vitamin B12 4.4 μg – 176% NRV, iodine 40 μg – 27% NRV, inositol 20 μg, choline 20 μg.